When dealing with mental illness — either your own, or a loved one’s — you can feel pretty powerless. So many things are beyond your control. Even what most of society perceives as simple activities — like showering or socializing — can be a struggle. Speaking up about your own mental health, as well as listening to others, is one way of reclaiming your own narrative and taking some control over your situation. As someone who has discussed her mental health issues from a young age, actor and singer Demi Lovato knows this well. 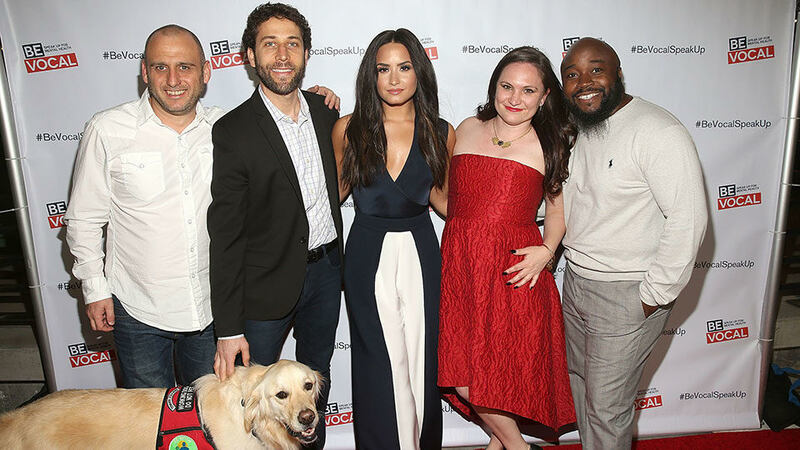 One of her most recent projects has been executive producing a documentary called Beyond Silence, in conjunction with Be Vocal — a partnership between leading mental health advocacy organizations and Sunovion Pharmaceuticals. Available to stream for free on the Be Vocal website, Beyond Silence tells the story of three individuals — Lloyd, Lauren and Jeff — who each live with mental illness and how it affects their everyday lives. Using the power of storytelling and visuals, the documentary offers audiences a glimpse into what it means to live with mental illness, get the help you need and thrive. Following a screening of the film at #BlogHer17, all three subjects of the documentary participated in a panel discussion on their involvement with the project and what they’re up to since production wrapped. Being a peer specialist allows Lloyd to use his experience to help others in his position. In order to qualify for the professional position in the state of South Carolina, a person must complete 52 hours of training and have a diagnosis of a mental health condition or a substance use condition and be living in recovery. She said that she tries to be “vulnerageous” — vulnerable and courageous at the same time. “It’s really important for all of us that we make things more attainable for others. I think we do that by sharing the hard parts of ourselves also. The truth is we’re all struggling and celebrating something,” she added. Now, Lauren is traveling around the country in a van giving free legal advice to immigrants and is in the process of starting an organization called The Possible Lab, which supports local entrepreneurs and people who want to start nonprofits. In addition to the human panelists, Jeff brought his service dog Earl, whom he uses to cope with sometimes debilitating anxiety and depression. Inspired by how much Earl has helped him in his own recovery, Jeff founded an organization called Go Fetch Wellness, which pairs humans living with mental health issues with animals to assist them in their wellness journey. For many people, getting a service dog is cost-prohibitive, he noted, so instead, Go Fetch Wellness helps pair people with the “right pet at the right time for the right reason” and eventually hopes to have dog wellness teams. Each of the Beyond Silence subjects explained the importance of talking about mental illness to help yourself and others.